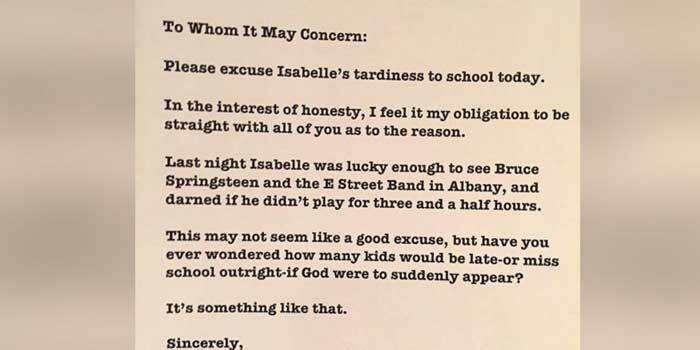 SARATOGA SPRINGS, N.Y. — In a major Dad-move win, Patrick Pipino of Saratoga Springs, N.Y., penned an honest note excusing his daughters’ school tardiness because the family attended a Bruce Springsteen concert on Monday, Feb. 8. “This may not seem like a good excuse, but have you ever wondered how many kids would be late — or miss school outright — if God were to suddenly appear?” states the note, which Pipino posted on his Facebook page. Pipino told ABC News that his two daughters, Isabelle, 12, and Sarah, 7, are both huge Springsteen fans.